Learning the guitar is hard. Or so you may have been told. Nobody likes endless drills. Most guitar classes might as well be boot camp for your fingers. Imagine what it’d be like if there were a fun way to learn, instead, where you start by playing real songs that you recognize on day one. Guitar games offer this promise, but they’re not complete. 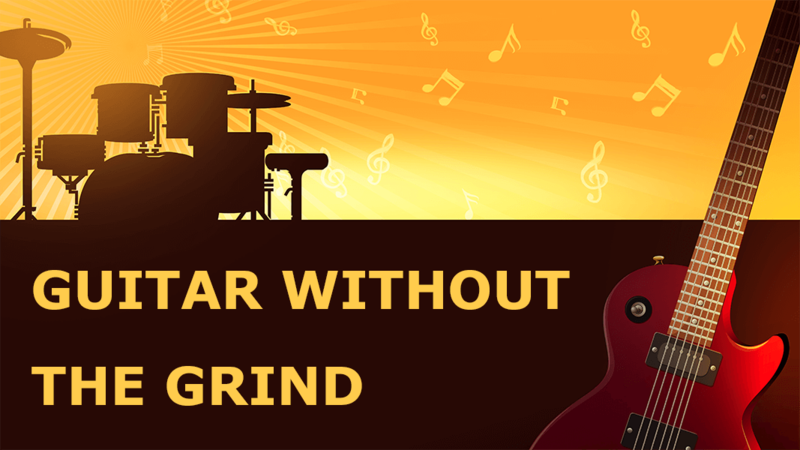 In this article I’ll compare two popular games, and then tell you the secret to learn the guitar without the grind. I’ve tried dozens of apps, games, courses and tools to help learn the guitar. My favorite two educational games are YouSician (formerly known as Guitarbots) and Rocksmith (the 2014 edition, by Ubisoft). An online catalog of the best resources for learning guitar, all completely free. Learn how to play anywhere. Yousician is meant to be used by the casual guitarist on-the-go. You’ll find catchy tunes that can be played on any guitar and on any device. Made by a team out of Helsinki, Yousician is a big step up from their original Guitarbots product. The old software was a web app which aimed to be a “real life guitar hero.” You could play with any guitar and any computer, and the game would teach you the instrument. Both GuitarBots and Yousician do their jobs well. On a technical level, the games detect the notes you play and score you for playing them clearly and at the right time. And since you can use literally any guitar to play (the game just uses a microphone), it is very realistic. That said, the songs provided in both are proprietary and therefore not as much fun to play as songs that you might already know. Specialization: instead of one size fits all, the software now asks if you want to practice rhythm guitar, lead guitar, etc. Education: the game now actually has videos with instructions from a real person. The second item ends up being incredibly important. When you don’t know what you’re doing, you end up inventing any way you can to try to score highly in the game. You might end up bending your fingers in some weird ways and developing some really bad habits. Adding video courses to the game might not totally fix that problem, but it’s a clear attempt to mitigate it at least. The big advantage to both GuitarBots and Yousician is that they are totally free to play. You can test them out today and see if they click for you. Play like a true rock star. You’ll jump straight into hit rock songs on your PC or console. A truly fun game, you’ll have a blast using this. The moment I started up Rocksmith 2014 by Ubisoft, I could tell that it had a very high production value. The graphics and general experience of the game make it clear that it was made by an established game design company. But how would it hold up as an educational tool? My first impression of the Rocksmith interface was that it felt awkward. For some reason, the vertically stacked guitar strings didn’t click with my brain. I found myself constantly fighting to remember which color/string was which. I got past that with time, though, and found myself really enjoying the game. For the first time ever, I was truly engrossed by music. Hours slipped away as I worked on just one song. I was elated when I finally nailed a riff that had been giving me trouble. And it was magical to actually hear songs which I like come together underneath my fingertips. As for the educational aspect: Rocksmith does a great job of making recommendations on what to do next. They’ve clearly invested a lot of thought into a system that detects what you need to work on, so you’re always challenged but not frustrated. The game seems to keep you in a constant state of flow, which can only be a good thing. YouSician is free-to-try and can be played with an acoustic guitar. Rocksmith has songs you’ve actually heard of before and higher production value. However, if you try using YouSician for more than the free daily period, you’ll quickly find yourself paying for a subscription that costs more than Rocksmith does. With Rocksmith, there’s a one-time fee (unless you want to buy more songs, but the game comes with a lot of them already). I’d also say that Rocksmith is more accurate at detecting right/wrong notes due to the proprietary cable they use. Instead of using a microphone, the cable connects directly from your guitar to a computer. It also has a wider breadth of techniques. In the 10 hours I played on YouSician, I learned more chords, but very little about hammer ons, pull offs, slides, bends, harmonics, etc. etc. etc. In the same amount of time with Rocksmith, I felt like I was actually learning about all of these elements and constantly being introduced to new ideas. There’s one big problem with guitar games: they don’t transfer into real-life well. You might spend hours and hours playing the game, and then not remember a single song when you want to show your friends. This even happened to me! I was shocked how dependent upon the game I became. Games are fun, but you need to be able to play without them to impress your friends. I want you to be able to show off your skills in any setting. Imagine sitting around a campfire, or in the room at your house and jamming along with friends. Maybe you’ll even join a band! I failed five times in ten years to learn the guitar, though. 75% of people quit in the first two months! You can do better. Here’s what I suggest. Try out the course below, Guitar Without The Grind. It’s a free course I put together to help you learn guitar, available only for readers of this blog. If it doesn’t solve all your problems, or if you want more help, email me directly. It’s up to you. There’s an unlimited course guarantee, and a discount when you use the link below. Give it a shot today. Your fingers will thank you. Thank’s for share your review. I really appreciatet it. Happy to do so! Let me know if you have any suggestions for other learning tools you’d like to see reviewed. What do you think if Instinct? I really liked what they had to offer 2 years ago, and I’m sure they’ve improved. I haven’t tried since though, because I’ve made bass my main instrument, and they don’t support bass. I never tried GuitarBots or Rock Prodigy, even when I was playing guitar more. I am a die-hard fan of Rocksmith, but haven’t played it nearly as much for the past year because I’ve been taking lessons. Rocksmith got me to the point where I wanted them. I love that “Rocksmith got you to the point you wanted lessons.” That seems like a good goal of any educational game: to get you to the point that you can see subtle needs like that. As for “Instinct,” I’ve actually not heard of it before! I’ll add it to my list of new products to test and review for the site 🙂 Any other suggestions? The four I mentioned are the only frequency-analysis-on-any-real-guitar programs I’m familiar with. One of the things I wish Rocksmith would add is ear-training games. I think Ear-training games where you could answer by playing your instrument would be a leap in music teaching technology. The two best tools I’ve found for ear training are Theta Music Trainer and EarMaster Pro 6. Couple things wrong in your review I’d like to correct. I have never played Rocksmith but I do use guitarbot/yousician. First it is awesome as far as not requiring a cable but it works much better with an interface cable like a light snake USB interface. Second it has plenty of songs you would recognize in its library and all of them are free and ranked by level of difficulty. It merely uses proprietary songs for the lessons. Hi, thanks for your comment! I didn’t realize that Yousician could support a cable, that’s great. However, the songs in the Yousician library are still midi/synth songs, even the tab translations. I played several of them and was seriously disappointed when compared to Rocksmith. In Rocksmith, you’re literally playing the studio recording of chart-topping-hits, not some tabbed version. To use the cable just plug in, go to settings, and select the USB port you are using and for the love of God don’t forget to check to make sure it’s picking up the sound from the cable with the test feature. I find a lot of times it counts me as missing notes and I look down and my light snake is dark (it glows green when it actually connects) because I didn’t double check. Have you looked into artist works? Not yet, no! Where can I learn more about it? I’ve been playing since I’m 15 years old and I’m pretty good. I wanna try this game because after all this time I still haven’t mastered solos and don’t know notes. I guess that’s the problem with teaching yourself. Someone once told me that you shouldn’t play guitar without being taught because you’ll learn the wrong way but I don’t think that’s true. It’s like the 10,000 hour rule. If you keep playing and practicing you’ll get good. It’s just a matter of forcing yourself to spend the time learning. Pick up the guitar and dedicate 20 mins a day and actually make sure you do it. You’ll see a difference in a month. You just have to do it. It’s the same thing with saving money. I started adding $5 a day at least to one of those 5 gallon jugs. It seems like it’s gonna take forever but if you just have the will power to make yourself do it you’ll quickly see that a year has gone by and you have quite a lot of money. You just have to make yourself do it. There’s plenty of stuff on youtube to get you started. Lessons and such. You just need the dedication. Remember, the more time you spend the better you’ll get. Start with learning the scales and learn the chords. You’ll be surprised how much you learn in just a month. You just have to do it. Thanks for the tips, Brent. Definitely, learning an instrument is all about diligence. You should give Rocksmith a shot, though! It makes the process much more enjoyable. Yousiscian now has an app and piano tutorials. It’s a fun way to learn some thing, but I do agree it leaves some keys (to learning) out. Unfortunately at this time I don’t see a rocksmith app. Yeah 🙁 There’s also tools like FlowKey for piano. Thanks for that! These apps are great for practicing though. It makes it fun. My kids now like playing with the instruments. Hey! I have been using both Yousician and Rocksmith for my bass, and I wanted to make a few remarks on my own. Mostly I play the bass, but I had this guitar gathering dust in a dark corner of my bedroom, so I decided to take it for a spin. What I feel is that both yousician and rocksmith are great to practice accuracy and technique (My technique has been improving a lot since I started using them both) but I had the same problem you had. I just couldn’t remember how to play any of the songs without the software! Another thing I noticed is that it is really hard to record what you’re playing on Rocksmith, since there is a lot of “noise” mixed up with your own playing. This also makes it harder to listen carefully to the mistakes the software doesn’t notice. Another thing I noticed, is that since the software emulates all of the pedals and amps and stuff like that, you never know exactly how to set your gear while trying to play a song, and I noticed a big difference in what I was playing with and without the software. I also agree with you that Rocksmith has a bigger focus on teaching you different techniques, and that once you start playing, it takes a long time for you to want to stop. Furthermore, I’d only add that you should also use apps such as guitar pro (or tux guitar for the adepts of open software such as myself), since they help you even more with remembering the songs you’re playing. Lastly, I must say that although all of those apps are great, ultimately, I learn a lot faster from youtube lessons, and I feel like the songs I learned in those lessons are the ones that stuck with me with time. What I’ve been doing is to alternate between all of those tools to get the best of all of them! I find Yousician particularly useful for getting a kid to play. These kids live and breathe for games. I’ve been entirely self taught for the last 15 years. This year we bought my 10 year old niece her first guitar, and I wanted to give her something I wish I always had, weekly guitar lessons. I’ve never taught anyone before, but i think that if I can sit with her once a week and fix any bad habits that might develop, then task her to playing Yousician everyday, she should be able to take off with that little sponge brain of hers! I don’t believe I could get her to practice if it wasn’t gamified. With Yousician, it becomes a fun challenge. I agree with some of the other comments that this is a tool to get you to a certain point, but honestly that first mountain to climb when you’re just starting out is the hardest part. It’s easy to get bored and discouraged in the beginning phase. Yousician is like sugar to help the medicine go down.